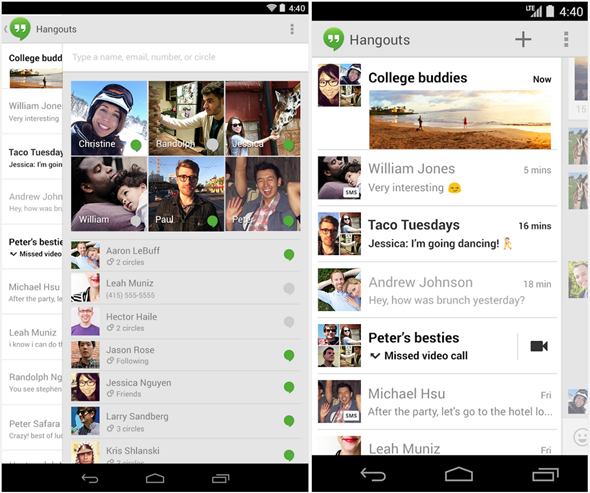 As expected, Google today released its much-anticipated Hangouts 2.0 update for Android. You can download the new version now directly from Google Play. The new version includes SMS support (as well as MMS support on Android 4.0 and up), animated GIFs, and one-tap location sharing. The last option is as simple as tapping the new pin icon in the bottom right-hand corner of the app; Hangouts will then pull in your immediate position and post it within the conversation stream as a Google Maps thumbnail. SMS/MMS support means you can use Hangouts as your default app both for traditional texting and picture messaging in addition to Web-based instant messaging. This effectively replaces the stock SMS app, and in fact on KitKat, you have the option to set a default SMS app. In addition, animated GIFs now also play inline. SMS & MMS (Android 4.0+): Send/receive text messages with Hangouts! You can import your existing messages, quickly switch between SMS and Hangouts, and start group MMS conversations. Animated GIFs: send animated GIFs, cute kittens and all. Location: share a location in your conversations. Device, in-call, mood status: share what device you’re on, whether you’re on a call, or your current mood. Google first announced the improvements coming to Hangouts late last month, but the new Android version has become available now. At the time, Google said the update would be available in the Google Play store “over the next few days” and it delivered just over a week later. 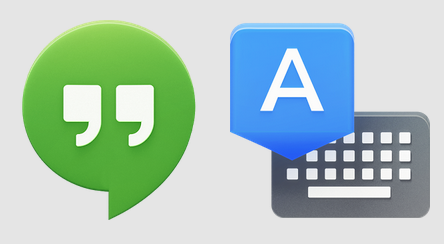 Now the wait begins to see how the Hangouts app for iOS will be updated. It will be difficult for Google to offer all the features to iPhone users given Apple’s strict requirements for its platform, but the company will certainly try to pack in as much as it can get away with.